I had to answer YES to the last question. But after finding the Ancestry tip article below, I checked mine. I’m still happy with the settings I did eons ago (and if you wondered, I have Basic Viewer turned off). BUT I found something neat that I had missed: RELATED CONTENT. This isn’t part of the Ancestry tip as it really isn’t a setting. HOWEVER, it appears on the Settings menu. Flyout of “See What’s New” in Tools menu. See What’s New (circled in the image to the right) has what kind of “related content” is available. Related Content is associated with the image you are viewing. #1 shows the members who also have this image record saved to their tree. #2 actually begins the displayed under Suggested Records. Definitely click on the NEXT > button and continue until you reach DONE. You just might find some surprises. BTW, I like the “Source” access off the tools menu too. 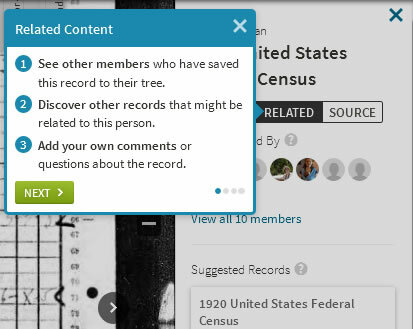 NOW — here’s the link to the Ancestry tip article: Using the Interactive Image Viewer (Updated 11/12/2015).